The Waste Land is a body of work that traces the haunting nature of our rejected possessions through a collaged, recycled and surreal world. The imagery for this project was gathered by traveling to landfills, searching through archives, digging through bags of household garbage, and documenting the alleyways of the cities I’ve lived in. 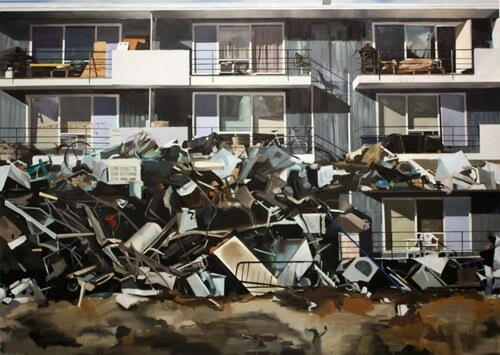 Collages based on this documentation are the inspiration for these paintings: the housing complexes that seem to grow out of mountainous landfills, the skeletal façades and the piles of forgotten things. At the heart of my work is the concept that our trash is akin to our unconscious mind. When we throw away our rubbish at the end of the week, we seal it into a black bag in an act of forgetting, wishing to never see it again. The very idea of someone else glimpsing the contents of our garbage seems incredibly intimate or invasive. My paintings are something of an act of acknowledgement toward this largely private and unexplored realm of our possessions. Even the landfills are teeming with our stuff, though we choose to disavow it. These mountains of things are a sort of accidental construction of our times, a shadow city built beside the one we live in. I wish to take a symbolic inventory of these things, to claim them as part of our lives. Andrea Kastner is a Kamloops-based painter who makes work about the sacred nature of rejected things. Her paintings of basements, alleyways and trash bring to light the hidden underbelly of things we seek to ignore. Raised in Montreal, Quebec, she completed her Bachelor of Fine Arts at Mount Allison University in Sackville, New Brunswick. After finishing her MFA at the University of Alberta in 2012, she was included in the inaugural show at the Esker Foundation, The New Alberta Contemporaries. That same year, she was selected as a finalist for the RBC Painting Competition. Her work was included in The Lure of the Local: Women Artists in the Canadian Landscape at the Vorres Museum in Athens, Greece. Her current painting project called The Waste Land tours Kamloops, Montreal, Hamilton, Courtenay and Dawson City in 2014. Andrea Kastner has received grants from the Canada Council for the Arts, the British Columbia Arts Council, The Edmonton Arts Council and the Elizabeth Greenshields Foundation. YUKON 48 FILM Challenge this weekend!